The Blink Reflexometer being used to measure the blink reflex of a cadet at the Citadel. Credit: The Citadel. The Centers for Disease Control and Prevention estimate that between 1.6 and 3.8 million concussions occur each year in the US. In addition, research indicates that nearly a quarter of annual traumatic brain injuries among children are sustained during high-contact/collision recreational activities or sports. Unfortunately, current methods for diagnosing and evaluating concussion severity are not very accurate. Medical professionals and field-side staff must base concussion-related decisions on overt symptom assessments (e.g., balance, neurocognition) and self-reports that often provide incomplete, misleading or conflicting information. Nancey Trevanian Tsai, M.D., clinical assistant professor of neurosurgery at the Medical University of South Carolina (MUSC), and Dena Garner, Ph.D., professor of health, exercise, and sport science at The Citadel, collaborated to study whether a new device, the Blink Reflexometer, could help fill this urgent need for more objective measures of concussion severity and outcomes. The promising findings of that study are reported in the January issue of Cogent Engineering. Tsai, who developed the Blink Reflexometer with the support of the Zucker Institute for Applied Neurosciences (ZIAN), became acquainted with Garner via her prior doctoral and postdoctoral work in MUSC's Department of Neurology. When Tsai asked if she might be interested in testing the device in a group of healthy participants, Garner jumped at the opportunity. "I was excited to see this type of technology coming out to help us better pinpoint and potentially aid in the diagnosis of concussion," said Garner. "Concussion is a mild traumatic brain injury and we know it's under-reported because, so often, it goes unnoticed or undiagnosed. The chance to test a piece of equipment that can be used field-side to assess concussions was especially compelling." A high-speed videography-based device, the Blink Reflexometer triggers, records and analyzes detailed information about a person's blink reflex. The person being evaluated wears a mask that delivers three to five air puffs at random intervals over 20 seconds to the outer corner of the right or left eye (randomly selected). After approximately 20 seconds of rest, two more sets of puffs are delivered to complete the session (a total of 6 to 12 puffs per session). The blink reflex is recorded at 280 frames/second and specific frames are then isolated and analyzed. Garner collected blink reflex data from 24 Division I, male football players (18-22 years of age) over the 2015 and 2016 athletic seasons. Preseason baseline values were established for ten blink reflex parameters, athletic history, physical examination, balance parameters and neurocognitive test scores. During the study, participants were divided into two sub-groups based on whether a concussive event was suspected (Head Impact [n=14]; Control [n=10; age matched]). When a concussion or suspected concussion occurred, participants were re-tested within one to 48 hours after the event to collect post-event blink reflex measurements and standard concussion evaluation protocol results. First, the team investigated whether changes in the blink reflex after a concussive event could be differentiated from normal blink reflex changes that are known to occur during active sports play. Control athlete data revealed significant differences in specific blink reflex parameters between baseline and active play. After sports play, Control athletes (those without a head impact during the study period) had significantly increased blink latency, decreased differential latency, decreased lid velocity, longer time to open, fewer oscillations (cycles of up/down upper eyelid movement after a blink) and shorter total blink duration. Post-impact parameters among Head Impact athletes showed decreased blink latency, increased differential latency (time difference between start of ipsilateral eye movement and start of contralateral eye movement), decreased log of time to open and increased log of number of oscillations compared to their baseline values. Significant between-group differences in blink reflex changes were also found. Compared to their baseline values, Head Impact athletes had decreased blink latency, increased differential latency and larger lid excursions post-impact, while Controls had increased blink latency, smaller lid excursions and decreased log of number of oscillations after activity. "A human's blink reflex has a long pathway—originating at the facial area and continuing to the brain stem. If any place along that pathway is damaged, changes in the blink reflex can indicate that there is a potential problem," explained Garner. "We now know that concussions and normal play both affect the blink parameters, but in differing directions. Our observations identified something distinctly different occurring in the concussion brains that can serve as a valuable new indicator for diagnosing the condition." These results confirm that a device measuring blink reflex parameters has great potential as a field-side diagnostic tool to assist athletic trainers and medical staff in determining athletes' concussive status and making appropriate decisions to remove them from play. Importantly, because blink parameter assessment provides an objective measure of a primitive reflex, athletes cannot manipulate it. The authors emphasize that reporting these study findings is not intended to endorse the use of this particular device but to support the use of blink reflex parameter assessment as an objective measure of head impact severity immediately after the event and during recovery. In the future, Garner sees blink reflex measurement being used to assess a broad range of neurological disorders. 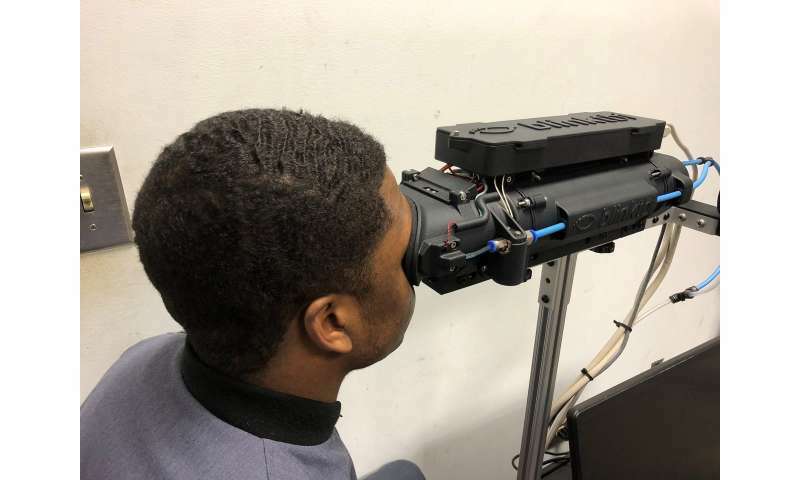 "We're now collecting normative blink reflex data in different age groups and other sports, with a future goal of collecting data from people with neurological diseases like Parkinson's and multiple sclerosis," said Garner. "We hope that one day we'll be able to use blink reflex data to help determine severity or progression in other diseases. There's really wide potential for its application." Neurological assessment in the blink of an eye? What do high school athletes, their parents and coaches know about concussion?